In a previous blog I wrote about the future of applications and desktops and the move to SaaS. In this blog I discussed the move of traditional applications to more and more SaaS applications. But one big withdraw of all the SaaS applications is, how are you going to publish all the different URL’s and authenticating methods to your users? And what if you still want to publish traditional applications and desktops to your users? In this blog I will answer those questions and more with Workspace 365. 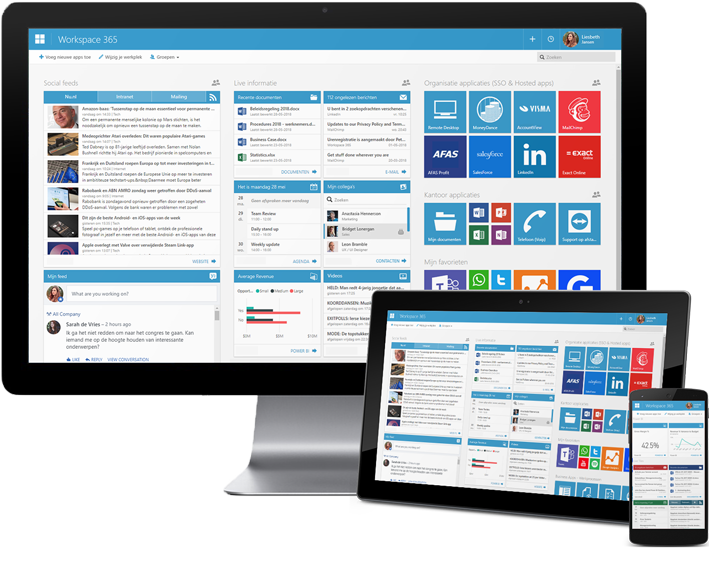 Workspace 365 by New Day at Work makes it possible to have one easy to use adaptive workspace for your users. In this adaptive workspace they will find their SaaS applications and Citrix or RDP published apps and desktops in neat tiles just like a modern start menu. And they can add many more tiles to their workspace and, like a start menu, organize them like they want. The digital workspace can be easily accessed by computer, tablet or phone. Furthermore, Workspace 365 automatically adapts to your role and your conditions (your network/device/browser/operating system). By doing this, users only see the things they need at the right moment. And it prevents people from accidentally accessing privacy sensitive data while they are on unsecure networks. One of the biggest and really unique apps in the workspace is the Document and Files management system. 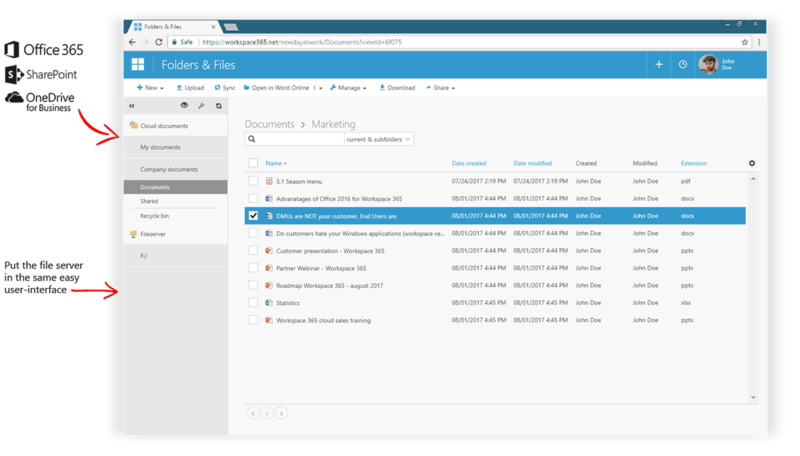 It lets you add the data from Office 365, Sharepoint, OneDrive for business and a local file server in the same interface! This way users can easily move files between the cloud and local and never have to open multiple websites and upload and download files. Companies can integrate their fileserver and start using Workspace 365 while they migrate the fileserver to SharePoint in sprints. By doing this, users are able to use a new interface which doesn’t change when the company modernizes their underlying technology. You can also make use of the business web apps. They will help you easily track your project, files, customers, timesheets and more. Workspace 365 can even help you write a custom business web app. This allows you to create a new interface for your users to do simple tasks, while keeping all the data synchronized with the underlying systems. One of the biggest take-aways from Workspace 365 by New Day at Work is just how simple the user experience is. You just sign in to one workspace(which adapts to your role and location) and you are able work productively immediately by reading emails, tracking activities, reading social feeds, and directly managing your files. And with one extra click you can start all of the companies SaaS and published applications, without the need to sign-in, download or update anythingYou can get a free demo environment of Workspace 365 here.